Save Ore Library demonstration. Photo by Roberts Photographic. The decision to re-open the council-owned building with community running was approved by East Sussex County Council cabinet member Cllr David Elkin today (Thursday, June 21). Three other East Sussex libraries, which had closed as a result of budget cuts, were given approval to re-open as community-run assets at the same time. They are: Pevensey Bay, Polegate and Willingdon. A fifth library at Ringmer re-opened as a community-run facility earlier this week. 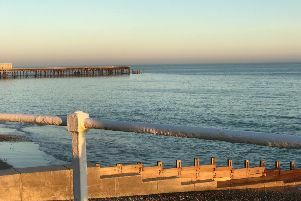 Pevensey Bay is to be run by Volunteers Network, Willingdon by Willingdon & Jevington Parish Council and Ringmer by the Ringmer Village Hall Management Committee . Meanwhile, Polegate Town Council will pay the county council to run a community library offering a very similar range of services to that provided when it was run by the county, with the long-term aim of establishing a volunteer-run library. Cllr Elkin said: “We’re delighted to be able to agree these very exciting plans for community libraries and look forward to them opening in the next few months. “Closing libraries was a very difficult decision prompted by the severe financial pressures we’re under and the changing way in which people access library services, but we’ve always been committed to working with communities that wanted to retain a library in their town or village. “Selling off or transferring the lease of these buildings would have generated a considerable amount of income for the council, but we recognise the value these community libraries will provide. The new community libraries will not form part of the statutory library service provided by the council.